TONY Notte cemented his legacy as a great of the Swan Districts Football Club by winning his second Swan Medal during a memorable night celebrating the 2018 season at the picturesque Mandoon Estate on Friday night. 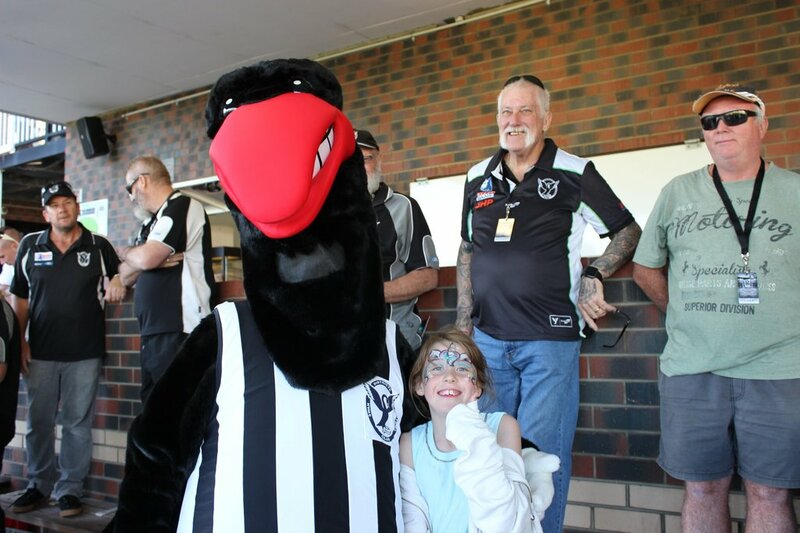 Over 200 club supporters were on hand at Mandoon Estate in the Swan Valley on Friday to witness the medal counts for the colts, reserves and league teams at Swan Districts for the 2018 season culminating in Tony Notte winning his second Swan Medal. It was a tremendous night celebrating the 2018 season that saw two of the three grades at Swan Districts reaching the finals with the reserves reaching a first semi-final against Claremont while the colts had a stirring run all the way to the Grand Final, falling just two points short of a stunning premiership. The awards night also included Freddie Clutterbuck being named fairest and best for the reserves and Mitchell Bain for the colts while Matt Riggio received his life membership having reached 150 games, and the careers of the retired Kirk Ugle and Todd Banfield were also celebrated. 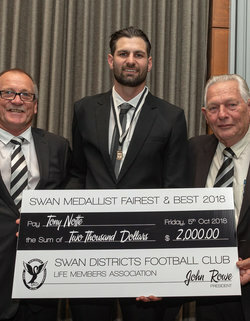 The night continued to highlight what a tremendous servant of the Swan Districts Football Club Tony Notte is as he won his second Swan Medal. Whether playing up forward as a marking target, pinch-hitting in the ruck or in his most regular role at centre half-back where he is the best intercept mark in the competition, Notte has now put together a remarkable 219-game league career at Swan Districts. 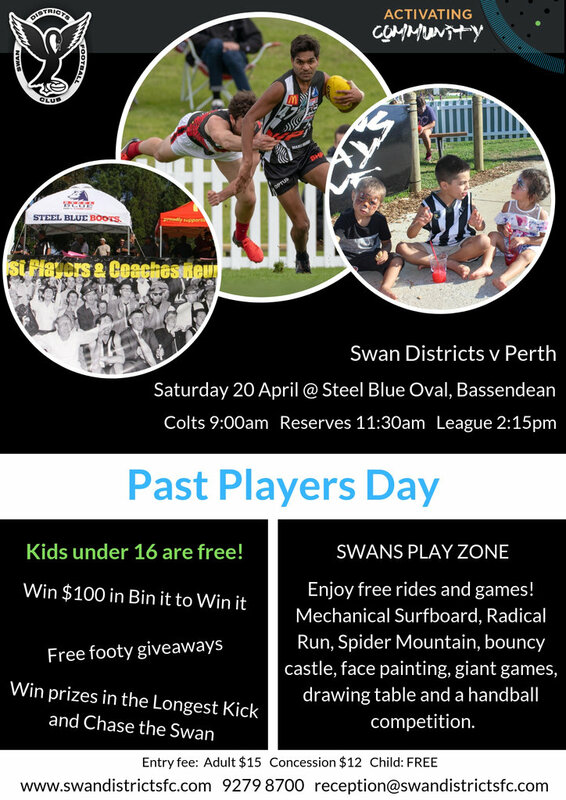 The 28-year-old made his debut for Swan Districts back in 2008, playing in the Grand Final of that year, and he has never looked back going on to become one of the finest servants in black-and-white who is showing no signs of slowing down. Notte had another outstanding 2018 season playing a variety of roles for Swan Districts averaging 13.8 disposals and 5.8 marks again showing tremendous durability and consistency by playing every match. His durability is now becoming the stuff of legends with Notte having played 144 consecutive matches. The last games he missed were the final three of the 2011 season. Notte is a regular high up in Swan Medal voting and now has the 2018 award to go with his triumph of 2013 having also been runner-up to Corey Gault in 2017. Notte claimed the 2018 Swan Medal by polling 97 votes to win ahead of Tobe Watson (84), Corey Gault (81), Alex Howard (64), Matt Riggio (59), Rhys Palmer (49), Nathan Blakely (44), Brayden Noble (44), Todd Banfield (38), Jesse Turner (37) and Steven Payne (36). By finishing as runner-up in Swan Medal voting and claiming the Norm Thomas Memorial Award and also the RA Newbey Award as Rookie of the Year, it was a tremendous recognition of the season Watson had. Having found his way into the league side late in 2017, including the finals campaign, he took the next step in 2018 becoming a key member of the Swans team starting in the back-line before spending time in the midfield and even up forward on occasion. Backing up his Swan Medal victory of 2017, Gault finished in third-place in 2018 voting after a season where he spent the majority of his season as a key forward before ending the season down back and also backing up Nathan Blakely in the ruck. Speaking of Blakely, his season was a tremendous success after two years out of the WAFL and that was recognised with him receiving the Jack Hickling Memorial Award as the Most Outstanding Player on and off the field. There were plenty of experienced campaigners in Swan Districts' reserves team for much of 2018 and that was highlighted in the award winners with 137-game WAFL veteran Freddie Clutterbuck winning the FA Bonney Sweetapple Memorial Award as the fairest and best. Clutterbuck polled 70 votes to win ahead of another league veteran of 120 matches, Adam Faulkner (63) in front of Ethan Maguire (53), Callum Garcia (51), Brandon Erceg (49), Jack O'Sullivan (47), Albert Dean (44), Levi Ridley (40), Brad Fullgrabe (36), Mitchell Bain (35), Mitch Mackenzie (34), Aaron Wheeler (34) and Tom Whittle (33). Swan Districts' colts turned out to be the great success story of 2018 with new coach Greg Harding leading them all the way to the Grand Final at Optus Stadium where they came ever so close to coming home with premiership glory against Subiaco. The colts season was celebrated with Mitchell Bain claiming the EJ McManus Award as fairest and best winner to go with a season where he also played reserves and league football, and won the Goal of the Year Award for his stunning running effort in his league debut in Round 21. He polled 135 votes to claim the colts fairest and best award ahead of Kade Wallrodt (103), Denzel More (74), Jackson Beck (68), Patrick Farrant (61), Riley Garcia (59), Joe Hinder (59), Harry Edwards (58), Atem Deng (55), Seb Bright (54), Jarrod Cameron (53), Graydon Wilson (36), Matthew Germs (24), Ben Taylor (22), Jaygar Martin (18) and Brenton Hilton (18). To see all the photos from the night, click here.